Welcome to your goals: new design, more functionality. The unique networking of door and window technology with smart software. GEZE stands for innovation, highest quality and holistic support of building services engineering – from the initial idea, planning and operational implementation with series products to tailor-made system solutions and individual service and maintenance. We offer an extensive product range of door, window and security technology and are a major driving force behind the digital networking of building automation. Automatic door solutions for accessibility or fire protection, window drives for natural ventilation or for smoke and heat extraction in the event of fire, digital networking of doors and windows for building automation - these are just a few examples from our service portfolio. Our goal is to develop liveable buildings with the highest degree of comfort and the greatest possible safety for building users. Individual solutions for your building Office complexes, hospitals or shopping centres - here, you can find the right solutions for your building in terms of functionality, convenience and aesthetics. BIM is the big digital issue in the construction industry. More efficient and resource-saving building planning. This is the goal of BIM. Dipl.-Ing. Günther Weizenhöfer explains what contribution GEZE can make to integral building planning. We are an international family business. Managing Director Sales Tomislav Jagar explains how GEZE manages the balancing act between German quality work and agile methods, while remaining ahead of the game. New exhibition stand, enthusiastic customers, highlight products – our Pre-sales Manager Peter Rürup reveals what GEZE shows at the BAU trade fair in Munich. GEZE customer Jonas Wessler’s masterpiece demonstrates just how versatile innovative products can be: a sideboard with integrated soundbar, which is controlled intelligently via GEZE window drive and the Somfy app. GEZE’s automatic rotating doors with specially adapted door drive solutions ensure the ultimate access convenience and accessibility at the prestigious entrances to this 5-star hotel. Our mission is to provide user-oriented building automation in your buildings with new possibilities. Visit us at the ISH from 11 to 15 March 2019 at Messe Frankfurt in Hall 10.3, Stand B 30. Visit us at the FeuerTrutz in Nuremberg from 20 - 21 February 2019 and see our new solutions for preventive fire protection. Renovating buildings and changing the fire protection concept in listed buildings poses challenges, e.g. laying the cables for the fire protection solution. GEZE hold-open systems are the solution, now with our wireless kit FA GC 170. At BAU 2019 in Munich, we present numerous solutions for liveable buildings. In our exhibition video you can see the central highlights. Visit us also until 19.01.2019 in Munich at BAU in hall B1 on booth 538-539. A successful project always starts with a good conversation. Visit us at the VdS-BrandSchutzTagen in the KölnMesse, Congress Center East, in Hall 11.1, Stand E-05 from 04.-05.12.2018. Visit us at the A@W at Messe Stuttgart in hall 10 from 05.-12.6.2018. Visit us at the A@W in Berlin from 07.-08.11.2018. Securing emergency exits and accessibility play a key role in the new cruise terminal in Rome. GEZE has made a decisive contribution with automatic doors and emergency exits. Windows can also be dangerous. GEZE offers sensor solutions, as well as mechanical safeguards such as safety scissors and safety retaining devices. Visit us at the belektro from 06.-08.11.2018 in the Berlin ExpoCenter City in hall 1.2, booth 205. Enter the spectacular CityLife shopping centre in Milan: innovative GEZE automatic doors and sliding door systems ensure excellent ease of access in Milan's newest attraction. Manual and automatic fanlight openers ensure the easy and reliable opening of fanlight windows, guaranteeing a constant supply of fresh air in the building. Specially conceived for use in preventive fire protection: GEZE hold-open systems hold fire and smoke protection doors open, but reliably close them in the event of a fire. Night-time window ventilation represents a particularly cost-efficient and energy-efficient method of air conditioning in buildings. GEZE supplies the right window technology for this. Good air ensures efficiency and wellbeing. Indoor climate controls increase comfort levels and save energy. Building Information Modelling (BIM) is the modern working method for the integrated planning, optimising, creation and operation of buildings. GEZE offers several free BIM door objects. Modern access control systems electronically regulate who goes where within a building or site, and when. GEZE believes in sustainable building. Our products meet DGNB and LEED criteria, some of the most important certificates for the sustainability of a building. The BMW branch in Munich draws attention to its cars perfectly with impressive glass façades. The elegant automatic doors by GEZE fit seamlessly into the contemporary glass design. GEZE has made a contribution to door convenience and safety in the new company building for Vector Informatik, with BACnet-based building management technology and intelligent networked door systems. No more bad air. With automatic window drives by GEZE, you can ensure enough fresh air gets in to all kinds of buildings - in a natural and energy-efficient way. GEZE has been involved in the building of the prize-winning Madrid-Barajas airport terminal, with innovative sliding door systems and safety solutions. The modernised Vienna BahnhofCity West impresses with its state-of-the-art architecture and technology. Innovative door systems by GEZE ensure convenience, accessibility and preventive fire protection. The centre of the Austrian car, motorcycle and touring club ÖAMTC in Vienna is perfectly equipped to fulfill the values of mobility and safety with revolving doors and preventive fire protection by GEZE. You can increase the comfort, the security and the energy efficiency of your existing properties through building renovation works. GEZE supports you in this with the right products. Comprehensive GEZE security solutions and GEZE access control elements ensure optimal protection for people and goods. Smoke and heat extraction (RWA) is part of preventive fire protection, and saves lives in the event of a fire. GEZE offers RWA solutions with intelligent drives for doors, windows and skylight domes. Energy efficiency is of major significance for architects, planners and users. Because a large proportion of the total consumption of end-use energy costs is accounted for by buildings. GEZE provides energy-saving and sustainable solutions for door, window and safety technology. GEZE makes a contribution to comfort and security on the AIDAdiva: GEZE can be found on board the new club ship with its tailor-made door technology and functional sliding wall systems. The new Gelsenkirchen judiciary centre is characterised by its state-of-the-art design and sophisticated functionality. GEZE automatic doors contribute to convenience and safety in the building complex. Elegant semi-circular glass sliding doors mark the hotel entrance area: Slimdrive SCR drives move the door leaves and welcome guests to the hotel with scarcely a sound. Tailor-made door and safety technology for the new Donau City landmark in Vienna; GEZE has equipped the DC Tower 1 with state-of-the-art automatic sliding doors. GEZE sliding door systems open the way to prehistoric cave paintings: state-of-the-art GEZE door technology is being used in the latest replica of the legendary caves at Lascaux. The new Stuttgart city library is characterised by a bright, open room structure and minimalist design. GEZE has contributed to the barrier-free building concept with tailor-made door technology. The automatic doors and sliding wall systems by GEZE fit discreetly and efficiently into the historic architecture of the legendary Café Luitpold in Munich. Contemporary partitions with manual sliding wall systems, sliding doors and all-glass systems - GEZE creates variety, design and functionality. The Stuttgart retirement home unites ambitious architecture with high fire protection and comfort requirements. GEZE door systems and security technology help achieve this. Accessibility and user-convenience take priority in the Stuttgart city centre clinic. GEZE has implemented barrier-free door systems and fire protection solutions that harmonise with the contemporary room design. A barrier-free administrative centre has been created in Leonberg with the new town hall. The door and window solutions from GEZE perfectly integrate into the purist design of the new building. Slamming doors, or doors that are hard to open, are a thing of the past in the 'BEHANDELBAR 3.0' physiotherapy practice: the clever GEZE Active Stop door damper unites accessibility with silent ease of access. Operate buildings more safely, comfortably, efficiently, and economically: GEZE will present new and innovative system components for fire protection doors. The Heidelberg Ethianum sets the highest standards in matters of convenience and safety. GEZE has equipped the multi-disciplinary new clinic building with innovative door systems and safety technology. In the new ‘atrium’ at the Robert Bosch Hospital, complex door and safety technology by GEZE helps to meet the maximum preventive fire protection and accessibility needs. Protecting and saving lives - fire protection doors play a crucial role in the event of fire. They delay the spread of fire and create an opportunity that could help to save lives. Increased comfort, efficiency and safety: digital control and automation technologies make buildings into 'smart buildings'. Modern buildings should be usable and controllable in a safe and convenient manner, and consume as little energy as possible. These demands can be met with automation and the intelligent networking of technical equipment. Smart façades react actively and independently to their environment. The aim is to lower energy requirements to a minimum and to increase convenience and safety for the user. Fresh air from outside - an optimum and healthy indoor climate through a controlled exchange of air through windows activated by electrical motors. Doors that are always open and yet safely locked - escape and rescue routes have to meet some tough challenges. Intelligent emergency exit system solutions by GEZE are the perfect solution for this apparent contradiction. Automatic doors make everyday life easier. Not only are they convenient, they save energy too. They facilitate barrier-free access and passage, while meeting the most stringent of safety demands. Put an end to banging doors. Door dampers catch closing doors before the “thud” And then silently close them completely. Accessibility allows everyone to live as equals, self-determinedly, and without external help. It ensures a better quality of life, greater comfort and increased safety for young and old. Thanks to its height and its prominent silhouette, the Roche Tower is impressive. GEZE has contributed to the building safety at the Roche Tower with complex door systems adapted to suit the state-of-the-art architecture. State-of-the-art door systems and RWA solutions by GEZE are concealed behind the listed façade of the new ARCOTEL Camino in Stuttgart - harmoniously adapted to meet the design concept of the hotel. The Grand MOMA in Beijing is one of the first projects in China to focus on 'green architecture'. GEZE swing doors and door closers are contributing to the building safety in the vast complex. The i360 viewing platform in Brighton in the south of England takes visitors to a height of 138 m. GEZE UK ensures convenient access to the viewing tower with tailor-made sliding door systems. Bathe like you're in the Mediterranean: the Badeparadies Schwarzwald impresses with its transparent glass construction. 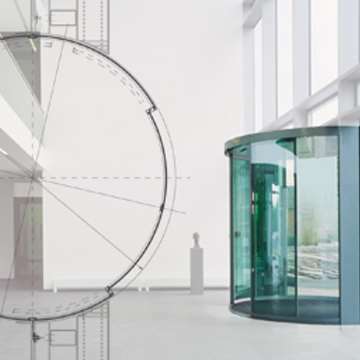 GEZE has provided innovative revolving doors tailored for the special glass façades. The award-winning new building at the Messe Stuttgart exhibition centre is characterised by innovative design and user convenience. GEZE swing doors and automatic doors meet these high demands perfectly. 'Better city, better life' - the EXPO in Shanghai has chosen sustainability as its guiding principle. Many of the international exhibitors have opted for innovative door systems by GEZE. The Kottenmatte Sursee vocational training centre has expanded its school building. GEZE has contributed to the design and functionality of the new building with a state-of-the-art, tailor-made sliding door system. State-of-the-art window technology for the reconstructed Frauenkirche Dresden: GEZE has integrated tailor-made RWA systems into the historic building material. The Leonardo Glass Cube impresses with state-of-the-art glass aesthetics: A perfect environment for the innovative integrated all-glass systems (IGG) by GEZE, which enable the creation of immaculate glass façades. In the new building complex of the Swiss firm Jansen AG, automatic doors by GEZE contribute to convenience and preventive fire protection - in line with the state-of-the-art building design. The networked building management technology installed at the crane manufacturer’s state-of-the-art sales and training centre is impressive GEZE supports the 'smart building' concept with BACnet-based door technology. Visitors to Ferrari World in Abu Dhabi will experience the thrill of speed with maximum convenience: GEZE has implemented accessibility in the building with intelligent automatic doors and door drives. As Germany's first mountain resort, the Kempinski Hotel Berchtesgaden surprises with its luxurious functionality. GEZE has contributed to this with innovative door closers and automatic doors. GEZE is at the World Cup in South Africa - with state-of-the-art door and safety technology. GEZE has contributed to preventive fire protection in two of the newly built stadiums with RWA solutions. The extraordinary concept of the ICEHOTEL 365 in Jukasjärvi, in the north of Sweden, combines art, comfort and design in ice. GEZE provided the sliding door for the impressive hotel façade. Architecture and building technology are fully designed to meet the needs of small patients at the John Radcliffe Hospital in Oxford. GEZE swing doors and sliding door systems support the concept. Fire protection doors and safety solutions by GEZE are a perfect visual and functional fit in the Victorian architecture of the fully modernised Wakefield town hall. The Dubai Opera towers over the surrounding skyscrapers like a glass ship: GEZE has participated in the futuristic project with its swing doors and emergency exit solutions. GEZE is presenting innovative solutions for preventive fire protection on doors and windows at FeuerTRUTZ 2018. The trade fair takes place from 21 to 22 February 2018 at Nuremberg Exhibition Centre (NürnbergMesse). Smart buildings are really only truly ‘smart’ when the doors and windows are also automated, and integrated in a building system. Experience innovative GEZE solutions from door, window and safety technology and building automation systems at FENSTERBAU FRONTALE 2018. GEZE invests in research and development: the GEZE development centre in Leonberg is setting new standards in terms of networked building automation. The new shopping centre is the highlight of the Stuttgart Milaneo complex. GEZE has contributed to the comfort and energy efficiency of the building with state-of-the-art automatic doors. GEZE has contributed to the aesthetic building design and high demands for functionality and convenience in the City of Glasgow College, with state-of-the-art revolving doors and swing door systems. The Mall of Scandinavia in Sweden is one of Scandinavia's biggest and most state-of-the-art shopping centres. GEZE has contributed to the ease of access to the building complex with 150 automatic door systems. GEZE has contributed to the complete renovation of the historic Sihlpost building with tailor-made door systems and safety solutions, and has achieved easy access in an authentic design. GEZE is one of the world’s most successful providers of solutions for of state-of-the-art door, window and safety technology. Behind this success have always been competent, committed and last but not least, enthusiastic employees. To drive our growth forward, we are looking for clever minds keen to help write our success story. We are looking forward to your #application ! #GEZE wishes all #happyEaster & relaxing, sunny holidays! We have been a globally successful and financially healthy family-run business since 1863 Our workmanship, comfort and design have continually impressed our customers worldwide. While maintaining our consistency, we are always curious, dynamic and open to the latest trends and markets. We are driving forward the digital networking of building technology to develop liveable buildings. We employ around 3,100 people globally, and the trend is for further growth. Our international headquarters are located in Leonberg. Our 31 subsidiaries are located all around the world, however: To live up to our service principle, we are always close to our customers and can offer excellent service on site.